Happy Friday! 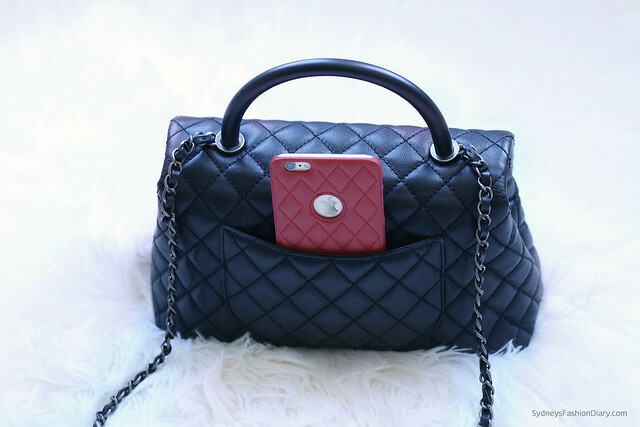 Today, I have a full review of this Chanel coco handle bag for you. I'll go over what fits inside and my general thoughts. I know this bag is relatively new to the market and hope you'll find this review somewhat helpful. I wanted to mention that I no longer own this bag :( Yes, I cried a little while packing but I'll save the reason why in a later post. I took a few photos to show you how much you can fit in it before sending it out. This is a size small (style code: A92991, currently retails for $3300, measurements: 9.8″ x 6.7″ x 4.7″). It's also available in mini ($3000), medium ($3600) and large ($3700) sizes. If you're my height, a small is the perfect size in my opinion (especially when carry as a shoulder bag). The bag hits me exactly where I wanted. The leather portion of the strap makes it very comfortable to wear. Even though it's a small, you can fit a ton. 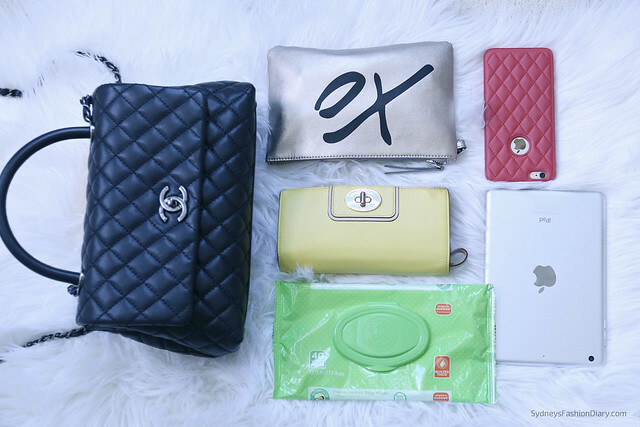 As you can see below: I have a mini iPad, a full size cosmetic pouch, a full size wallet, my iPhone 6 plus and a full size pack of baby wipes. 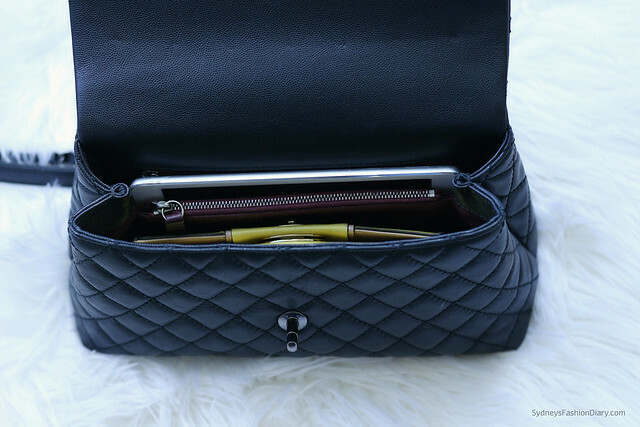 I don't ever carry a mini iPad with me but if you want, you certainly can. It fits perfectly in one of the 2 big compartments. 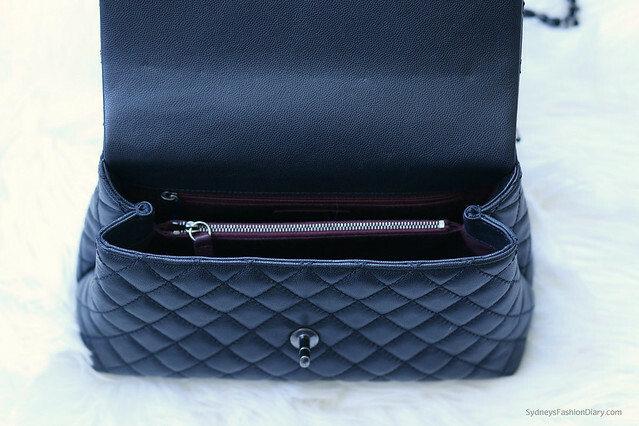 This bag provides great storage and organization capabilities. Love the divider in between. It provides great separation and not on big hole. 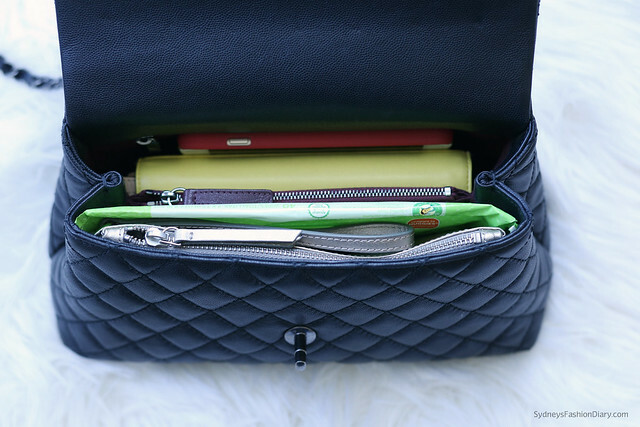 There is a middle zipper compartment for added security. If I was going to travel with this bag, this is where I probably will keep my passport or important documents. The back pocket is too small for my phone but it's great for some sort of tickets. Below is how I pack this bag. As you can see, everything fits comfortably and there's no problem closing the bag. This is the most I will ever carry with me on any given day even with my kids. There are 2 things that I thought I'd point out. # 1: It's made out of soft caviar leather. If you like the regular caviar on classic flaps, you probably wont' like the soft caviar. It's still durable and scratch free but it will lose its structure quicker. # 2: For some reason, the leather interwoven in the strap won't lay flat sometimes. Once in awhile, I had to take a few seconds to readjusting the strap. The craftsmanship is definitely not quite there. However, I personally think it's well price for a Chanel bag. It's approximately $2000 lower than a classic flap. I loved it then and still love it now. If it wasn't for a very good reason, I would definitely keep it in my collection. The particular bag is currently sold out everywhere but don't worry, Chanel is bringing it back this Fall. Below are the available combinations for this particular style if you're interested. I hope you find this post helpful. Even though, I no longer own this bag, I still wholeheartedly recommend it. It's a beautiful bag that you don't see often like a classic flap or a boy bag. It's versatile and more "affordable" compared to the other two.